MONROVIA – Twenty executive committee members of the former ruling Unity Party Tuesday voted unanimously to suspend eight of its Senators who went against the party’s mandate not to impeach Supreme Court Associate Justice Kabineh Ja’neh. 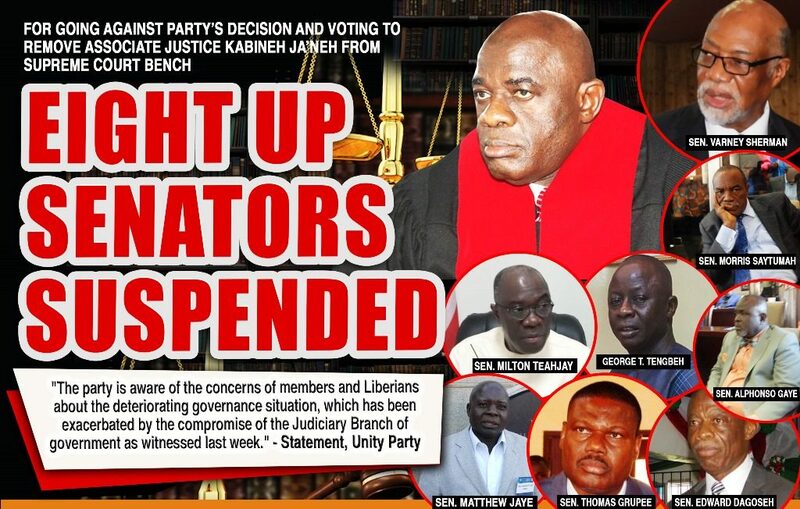 y executive committee members of the former ruling Unity Party Tuesday voted unanimously to suspend eight of its Senators who went against the party’s mandate not to impeach Supreme Court Associate Justice Kabineh Ja’neh. The party came up with the decision after nearly five hours of closed-door deliberation of a one item agenda at the party’s Congo Town headquarters. Those suspended pending further investigation are: Cllr. Varney H. Sherman – Cape Mount, Sen. Edward B. Dagoseh – Cape Mount, Sen. Morris Saytumah – Bomi, Sen. George Tengbeh – Lofa, Sen. Thomas Grupee – Nimba, Sen. Alphonso Gaye – Grand Gedeh, Sen. Matthew Jaye – Reivergee and Sen. Milton Teahjay – Sinoe. “The party’s executive committee members voted unanimously to suspend all eight Senators of the unity party in the senate pending investigation,” Mo Ali, National Assistant Secretary General for Press, Publicity and Outreach told FrontPageAfrica after the meeting at the party’s headquarters. He said the suspended Senators will be investigated and the investigation will determine further actions the party will take. He, however, could not tell when and how the investigation would be conducted. Ali added that the Unity Party believes that the decision by the Senate to impeach Justice Ja’neh undermines the country’s democracy. “We see it as an attempt by the executive to impose control over the Judiciary branch of government and we also see this is an attempt to rig elections in the future, where by there will be no independent Judiciary system”. He stressed that the entire impeachment process was politically motivated and unconstitutional and after having series of consultations with Senators of the Unity Party that they should vote against such impeachment proceedings, they refused and voted for the impeachment. “So, part of the investigation will focus on why they deliberately disobeyed the party,” he said. Nimba County Senator Grupee who was present at the party’s headquarters when the decision was made declined to comment. Sen. Grupee, however, according to Senator Prince Y. Johnson also of Nimba County, did not vote to remove Justice Ja’neh from the Bench. Sen. Johnson believes the votes were tampered with. It can be recalled that Mr. Abraham Darius Dillon, the chair of political affairs in the opposition Liberty threatened to leave his party if authorities in the hierarchy fail to expel Senator Jonathan Kaipay one of several senators who voted in favor of the impeachment Justice Ja’neh. 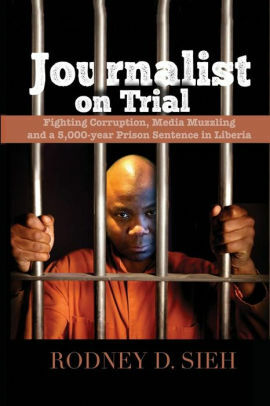 Speaking on his Facebook Live segment hours after the court came down with a ruling to impeach Justice Ja’neh last Friday, Mr. Dillon said Senator Kaipay brought shame and disgrace to the party by going against its position in the saga which prompted him to throw out a challenge to his party. Sen. Kaipee was subsequently suspended from the Liberty Party. A letter signed by the party’s national chairman, Sen. Steve Zargo, accused the Grand Bassa lawmaker of violating his oath of office and the party’s constitution by aligning with other senators who chose to violate the constitution. The party said Kaipay’s action was also in blatant deviation from his commitment to the country and the party.